Click here for larger jpeg image. 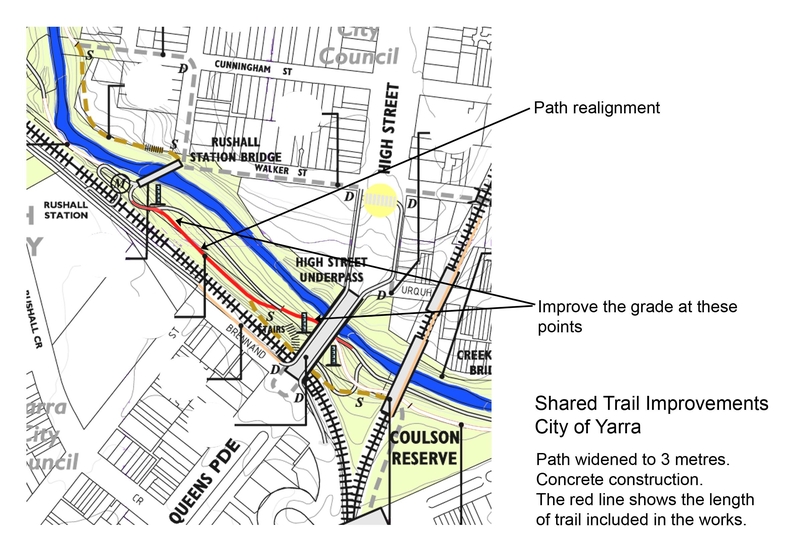 From around September 1st to 30th the City of Yarra will be carrying out works to improve the shared trail between the footbridge over the creek at Rushall Station, and the East side of the High Street overpass. The works will realign the shared trail and increase the width to 3 metres, as suggested in the Merri Creek Shared Trail Review recently conducted. In particular, it will reduce the steep grades just after the footbridge heading East, and just before going under High street bridge. This will improve safety for all users, and provide a suitable sized path for future users. The area under the bridge will be slightly raised and graded to drain to eliminate the ponding that has occurred here. The existing path will be removed and revegetated. The works have been timed to coincide with the Clifton Rail Duplication Works, so that disruption to cycle and pedestrian traffic will be only slightly greater than is in place with current diversions. There will be times during the works when there is no access to this stretch of track. At these times alternative routes will be shown. I have enclosed an image to give a broad idea of where these works are taking place. We will be working closely with the contractor to minimise disturbance to vegetation outside the proposed path area, and to revegetate where necessary.